The Muskegon ChannelCats are a non-profit organization run solely on the financial contributions of private individuals and businesses. Player fees and operating costs for the team are among the lowest in the area for travel baseball. 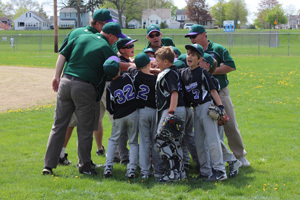 Player’s families cover the fees for uniforms, equipment, tournaments and player insurance. Thank you to this season's Muskegon ChannelCats Corporate Cat Backers! The Player’s Club is the Muskegon ChannelCats player sponsorship program. Help out your favorite ChannelCats player! Your sponsorship will be deducted from the player’s fee. Sponsors receive ChannelCats window decals and short and long sleeve T-shirts. Muskegon ChannelCats Corporate Cat Backers support baseball in the lakeshore community. Your sponsorship will help reduce team costs for players and provide recognition for your organization. Sponsors receive recognition via team emails, social media, and website banner ads. Muskegon Baseball Club Inc. is a 501(c)(3) non-profit organization making Muskegon ChannelCats Corporate Cat Backer sponsorship tax deductible.